Free-range grazing is probably not the right term for this, but everyone seems to get the idea. It's just letting the goats out of their pen to go nibble on bushes, grass, or whatever is available. You don't bother to tether or stake them out and you don't have to go goat walking with them. You don't want to turn your goats out to roam free in the neighborhood. That would make cranky neighbors, and possibly even dead goats. My idea of "free-ranging" goats is to turn them out in the front yard to run around, eat grass, and just have something different to do and see. My front yard is about one acre in size and completely fenced. It doesn't have anything in it that can hurt the goats: No poisonous plants, no break-their-little-legs hazards, no dogs running loose, no traffic, and plenty of shade and water for them. 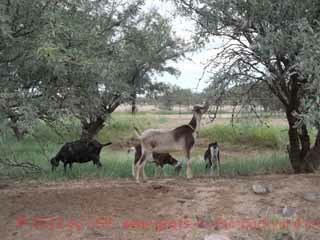 It also doesn't have anything in it that the goats can damage: No cars for them to jump on, no expensive landscape plants worth more than the goats, no garbage or laundry for them to chew up or eat (read my page "Do Goats Eat Tin Cans?" for more information on that problem). I can't always see the goats (or not all of them) from the windows in my house, but I step outside to check on them every half hour or so. I also keep my ears open for a goat crying. 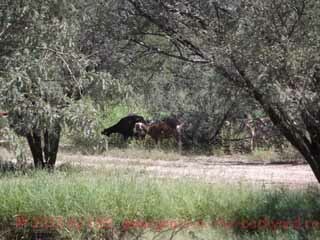 Usually it is just a squabble with another goat, but I ALWAYS go check, just to make sure. If the goats are having a problem, I am right there to help straighten it out. When I want to put them away for the night I call "Heeere, goat," rattle some grain in a can, and try not to get run over! Nothing fancy, but if you have the place (and it can be a lot smaller than an acre), let your goats run "free." They will love it! Try tethering or staking out your goats if you need to have more control over them, or can't let them just run "free." Want to Enjoy the Outdoors with Them? The goats aren't the only ones who can benefit from a good walk. How about going "goat walking" with your goats?